This is info concerning access from major cities and airports. 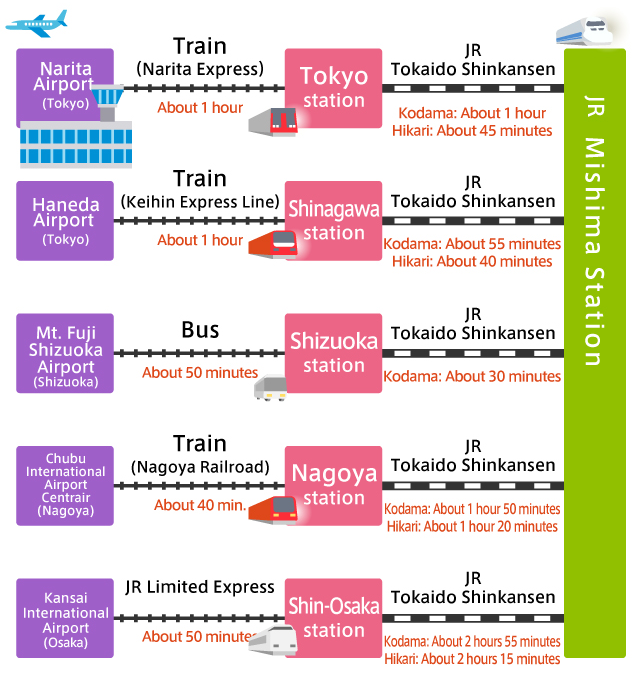 The Narita Express train will get you to Tokyo Station in about an hour. From there take a Tokaido Kodama Shinkansen train (takes about 1 hour) or a Hikari Shinkansen train (takes about 45 minutes) to get to Mishima. Take the Keihin semi-express train line from Haneda Airport to Shinagawa Station (takes about 20 minutes). From there take a Tokaido Kodama Shinkansen train (takes about 55 minutes) or a Hikari Shinkansen train (takes about 40 minutes) to get to Mishima. Take a bus from Mt. Fuji Shizuoka Airport to Shizuoka Station (takes about 50 minutes). From there take a Tokaido Kodama Shinkansen train (takes about 30 minutes) to get to Mishima. Take a Nagoya Railroad express train from Centrair to reach Nagoya Station in about 40 minutes. Then from there take a Tokaido Kodama Shinkansen train (takes about 1 hour 50 minutes) or a Hikari Shinkansen train (takes about 1 hour 20 minutes) to get to Mishima. Take a JR express train from KIX to Osaka Station (takes about 50 minutes). Then from there taka a Tokaido Kodama Shinkansen train (takes about 2 hours 55 minutes) or a Hikari Shinkansen train (takes about 2 hours 15 minutes) to get to Mishima.